Edward Abbey wrote fiction and non-fiction based upon the belief that an important link exists between individual freedom and the presence of wilderness areas. He was born in 1927 in Pennsylvania. He attended the University of New Mexico, receiving a BA in philosophy and literature in 1951 and a MA in philosophy in 1956. 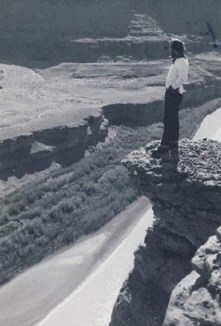 Abbey worked for the National Park Service at Arches National Monument during the summers of 1956 and 1957, an experience that inspired the book Desert Solitaire. He is perhaps best known for The Monkey Wrench Gang, whose characters attempt to halt construction of buildings and dams in wilderness areas. Abbey died in 1989, at the age of 62, in Tucson, Arizona. This small collection boasts a smattering of correspondence, a few photos, and corrected manuscript leaves for Confessions of a Barbarian. Abbey, Edward. The Monkey Wrench Gang. Philadelphia: Lippincott, 1975. Abbey, Edward. The Journey Home: Some Words in Defense of the American West. New York: Dutton, 1977. Abbey, Edward. Abbey’s Road. New York: Dutton, 1979. Abbey, Edward. Good News. New York: Dutton, 1980. Abbey, Edward. Down the River with Henry David Thoreau and Friends. New York: Dutton, 1982. Abbey, Edward. Beyond the Wall: Essays from the Outside. New York: Holt, Rinehart and Winston, 1984. Abbey, Edward. Confessions of a Barbarian. Santa Barbara: Capra Press, 1986. Abbey, Edward. The Fool’s Progress: An Honest Novel. New York: Holt, 1988. Abbey, Edward. One Life at a Time, Please. New York: Holt, 1988. Abbey, Edward. Hayduke Lives! Boston: Little, Brown, 1990.